NPR is streaming Chromeo’s newest release Business Casual until the record drops on September 14th. I’m hugely obsessed with Chromeo, and consider any tracks the duo touch cause for celebration. Business Casual is no exception. It continues the dance-driven groove of their previous records, replete with smooth Talk-Box choruses and slightly geeky, urgent lyrical come-ons. Chromeo’s lyrics are fun, their beats danceable and their melodies smooth. If you’ve only heard one or two songs, it might be tempting to read the band as a bit of a parody, but in countless interviews, the duo insist upon their sincere love of the music from which they borrow. It’s also doubtful that a parody could sustain itself through an entire album, let alone a near-decade long career. This sincerity probably keeps them just under the pop-radio radar, which is a good thing if you want to see them live. 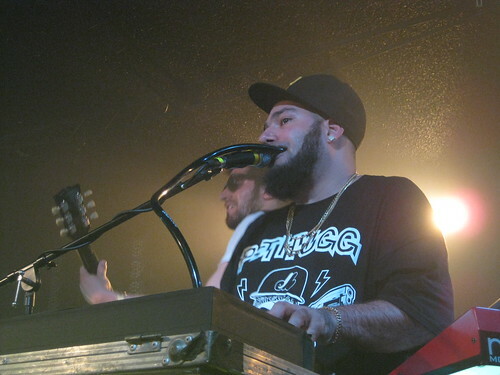 I saw Chromeo play at Berbati’s Pan when they toured in support of Fancy Footwork. It was a hot, sweaty crush of dancing and probably the most fun I’ve had at a show since I was in college. Live and on their records, Chromeo delivers the party, and while they would no doubt bring the same energy to a larger club, the small venue, with the band mere feet from the crowd, made for a more intense and exciting performance. If you’re in your early 30’s Night by Night will probably make all your party playlists this year. It combines an 8-bit video game vamp with some Beat It era Eddie Van Halen guitar soloing that makes for a fat, when-you-wore-high-tops sound that is both nostalgic and refreshing. If you miss the streaming of Business Casual, you should, of course, go buy the album. But you can also comfort yourself immediately with these performances they did with Daryl Hall of Hall and Oates.